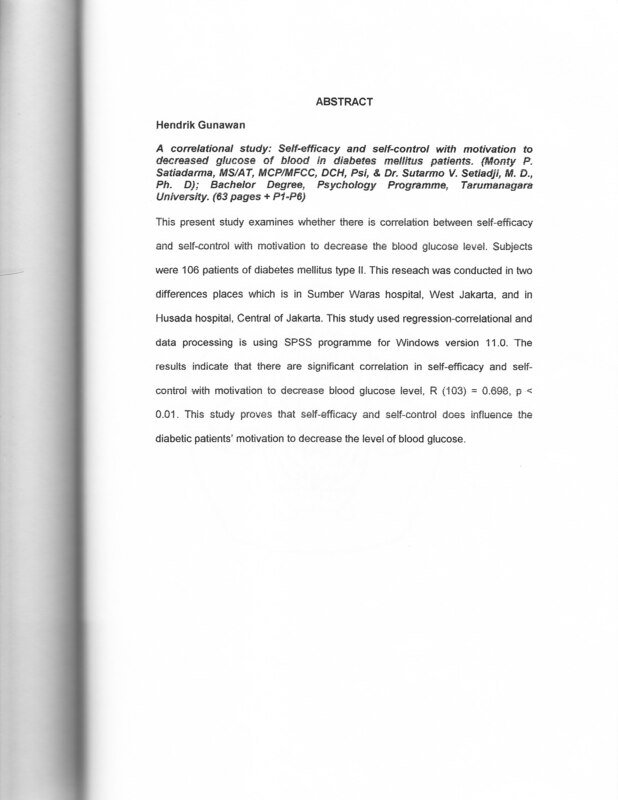 Gunawan, Hendrik (2005) Hubungan self efficacy dan sel control dengan motivasi menurunkan kadar gula darah penderita diabetes mellitus tipe II. Skripsi thesis, Universitas Tarumanagara.
" This present study examines whether there is correiatiort between seif-efiicacyand sed-control with motivation to decrease the blood glucose tevei. Subieets were 106 patients of diabetes mellitus type ll. This reseach was conducted in two differences places which is in Sumber Waras hospital, West Jakarta, and in Husada hospital, Central of Jakarta. This study used regression-correlational and data processing is using SPSS programme for Windows version 11.0. The results indicate that there are significant corretation in self-eft'icacy and self- control with motivation to decrease biood giucose ievei, R (103) = 8.698, e 0.01. This study proves that self-efficiacy and self-control does influence the diabetic patient's motivation to decrease the level of blood glucosure"